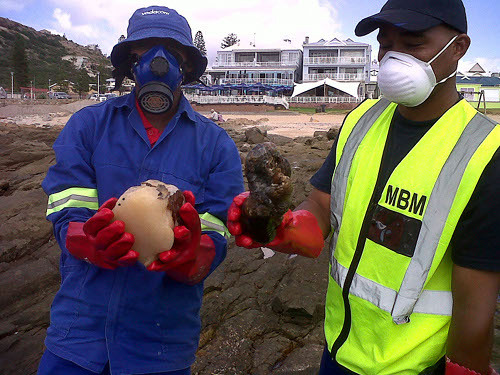 An unusual upwelling of red bait at Mossel Bay has cast a stench over large parts of the scenic town. The stench is so bad that tourist operators have called in the municipality to clean up the popular area and workers, wearing gas masks, gloves and rubber boots said they have removed eight tons of rotting red bait since Monday. Manager of popular Delfino’s restaurant on the point, Mariėtte Moll, said torrential rain, sewerage and spring tides were possible causes of the red bait being washed onto land. However, fisherman were happy as smelly red bait was good for catching fish. “Fishermen love the bonanza of fresh bait,” she said.